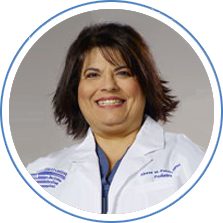 Dr. Abeer (Abby) Foteh graduated from California College of Podiatric Medicine in San Francisco, California in 1997 with honors and then completed her Podiatric residency at The University of Texas Health Science Center at San Antonio, Texas in 1999. She has been recognized for excellence by organizations such as Outstanding Young Women of America, Who’s Who Among Students In American Universities and Colleges and The Ramallah Community of Houston. The Research Council of America has voted Dr. Foteh one of Americas Top Podiatrists. Dr. Foteh has published articles on topics such as, The Assessment and Treatment of the Pediatric Flat Foot, and frequently provides lectures on diseases and conditions of the foot and ankle to Resident Podiatrists, Resident Family Medicine Physicians and other organizations. She takes pride in being a member of the local medical community and participates in community events such county health fairs and local hospital health fairs and special events. She maintains active membership in professional associations such as The American Podiatric Medical Association, The Texas Podiatric Medical Association, and Harris County Podiatric Medical Society. Dr. Foteh has special interest and advanced training in the areas of wound care and minimally invasive treatment of conditions such as plantar fasciitis and Achilles Tendonitis. Dr. Foteh has been in private practice in the Baytown/Houston area since 1999 and is on staff at all hospitals and surgery centers in the local Baytown and surrounding areas. She examines and treats most of her patients in her own private practice however; offers intense wound care to those patients whose condition requires it at specialized wound care facilities in the local area. X-Ray, Ultrasound, minor procedures and other specialized services and products are offered in the office. Dr. Foteh treats a wide range of foot and ankle conditions and sees patients of all ages. She accepts most private insurance plans, Medicare and Medicaid.